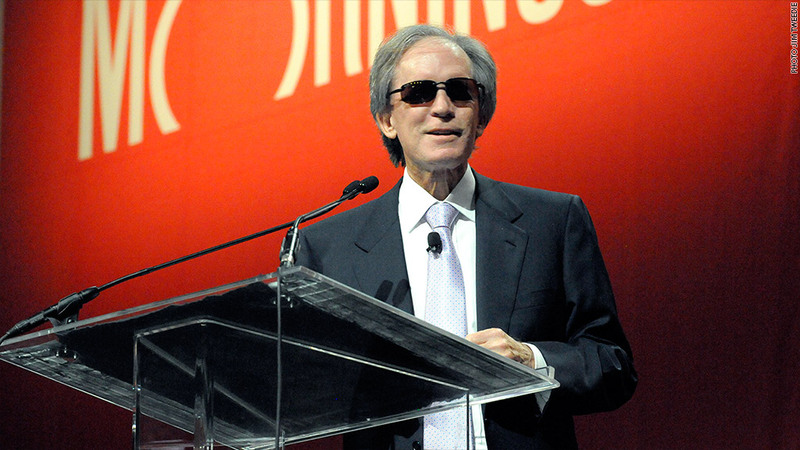 Bill Gross hit the stage June 19, 2014 at the Morningstar Investor Conference wearing sunglasses and trying to convince attendees his company is fine. Donning a pair of Hollywood sunglasses and distancing himself from Justin Bieber, struggling bond king Bill Gross declared on Thursday that his tumultuous firm is now the happiest place on the planet other than Disneyland. "We're a happy kingdom at Newport Beach," said Gross, founder and chief investment officer of California-based Pimco. His comments at the Morningstar Investment Conference in Chicago come as Gross, one of the world's most influential investors, attempts to stop an exodus of client money from his firm's funds amid disappointing performance. Earlier this year, Pimco shocked the financial world by revealing the departure of Gross heir apparent Mohamed El-Erian. The former CEO's exit triggered a series of negative articles that suggested Gross's erratic behavior helped drive El-Erian away. Given recent reports in the media, Gross said he was relieved not to be introduced as "General George Patton berating a wounded soldier or a Wall Street version of Justin Bieber." Gross joked that he wants to pull a "Manchurian Candidate" on the media by hypnotizing reporters into believing he's the "kindest, greatest, warmest, most wonderful human being in America." In that movie, a queen of diamonds was used to hypnotize soldiers into inflating the stature of a future candidate for vice president. Gross suggested the negative stories in the press may have helped cause his fund's outflows. "We're $50 billion poorer over the last 13 months. Perhaps we haven't been using enough red queens," Gross said. Or perhaps investors are just tired of lackluster performance. Gross is a star in the industry, but lately Pimco's Total Return Fund has performed about in line with the Barclay's U.S. Aggregate Bond Index. People only want to be in funds because they outperform an index. Investors yanked another $4.3 billion from Pimco's flagship Total Return Fund in May, making it the 13th straight month of outflows, according to Morningstar data. That was up from $3.1 billion removed in each of the prior two months. The fund now has around $229 billion. The flood of cash leaving Gross's fund came even as U.S. bond funds overall have enjoyed a boost in flows. Due to the departure of El-Erian, Pimco has been forced to reshuffle its management team. Gross said the firm's revamped management structure of six deputy chief investment officers is working fabulously and new CEO Douglas Hodge is exceeding expectations. "If there's a happier kingdom on earth, it may be 15 miles up the freeway" at Disneyland, Gross said. "But that's a fantasy." The bond king now has the perfect image to sell this blindingly bright storyline. He hit the stage wearing a pair of sunglasses and even took a moment to check himself out on the big screen. "Man, he is a pretty cool looking dude," he said. Correction: An earlier version of this story had incorrect performance information for Pimco's Total Return Fund.